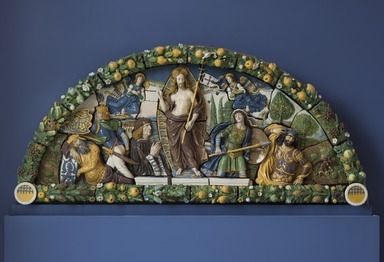 The Resurrection of Christ is a compositional and technical tour de force by the Renaissance artist Giovanni della Robbia (1469–1529/30). 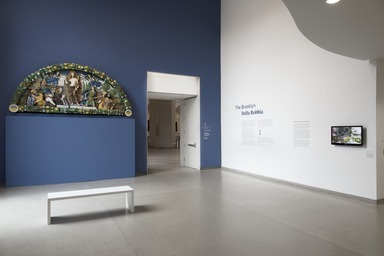 This massive relief sculpture, comprised of forty-six glazed terracotta pieces, portrays a vision of faith and salvation unfolding amid a vibrant cornucopia of naturalistic plants, flowers, and animals. 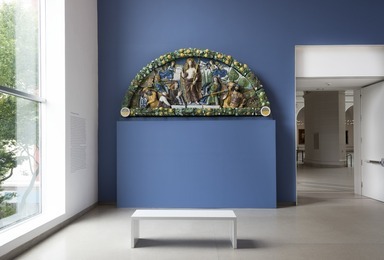 Replete with religious symbolism and references to antiquity, and to the wealthy Florentine patron who commissioned it, della Robbia’s early sixteenth-century masterpiece unites the spiritual and physical worlds. 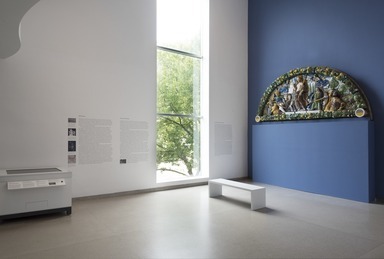 The prolific della Robbia workshop in Florence encompassed three generations of the talented, entrepreneurial family of artists whose colorful works ornamented civic, private, and religious buildings throughout the city and beyond. Luca (1399/1400–1482) established the workshop in the early to mid-fifteenth century and invented the proprietary glazed terracotta technique that would become synonymous with his family’s name. Luca’s nephew and collaborator Andrea (1435–1525) inherited the business when his uncle died in 1482. By the early sixteenth century one of Andrea’s sons, Giovanni, took on a leading role in the workshop, producing works like the Resurrection that are notable for their bold color effects, painterly passages, and energetic, spatially complex compositions. Around 1520–25, the Antinori family—prosperous silk merchants, winemakers, and patrons of the arts—commissioned Giovanni to create a work for their estate outside Florence. Scholars are not certain precisely where the completed Resurrection was displayed, but its arched (or lunette) shape indicates a location over a door or gate, perhaps in an entry area or, given its subject, in the family chapel. It remained at the estate until 1898, when the Antinori family sold it to Aron Augustus Healy, the board president of the Brooklyn Institute of Arts and Sciences (later the Brooklyn Museum), who gave it to that young institution. The Resurrection was the first Italian Renaissance work to enter the Museum’s collection and quickly became one of Brooklyn’s most significant artworks. Heralding its arrival at the Museum in 1899, The Brooklyn Daily Eagle proclaimed: “Every lover of Italian art will value . . . this treasure” (see illustration). 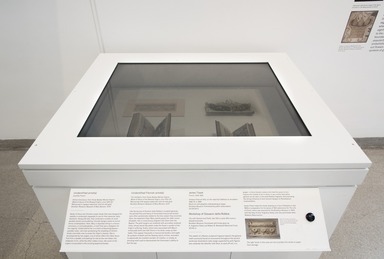 Institutional priorities shifted over the years, and since the mid-1990s this large sculpture has been either in storage or otherwise difficult to view. Now, after a major conservation project that was generously supported by Marchesi Antinori S.p.A., the same family of vintners whose ancestors commissioned the Resurrection almost five hundred years ago, we celebrate its return to prominent display in Brooklyn. 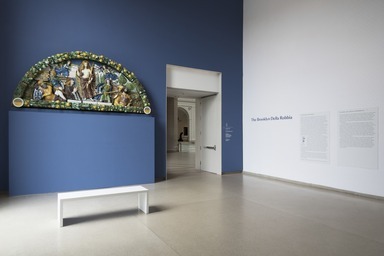 The Brooklyn Della Robbia is organized by Lisa Small, Senior Curator, European Art. 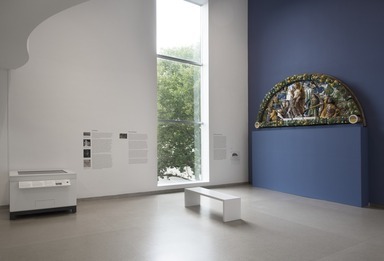 This video documents the yearlong conservation of Giovanni della Robbia’s The Resurrection of Christ, which was generously funded by Marchesi Antinori S.p.A in 2015. 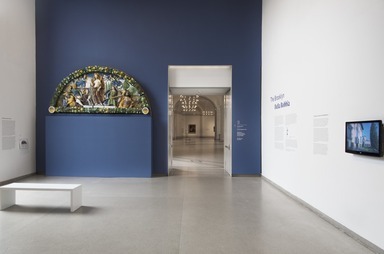 The project was undertaken to prepare the work for the exhibition Della Robbia: Sculpting with Color in Renaissance Florence, presented by the Museum of Fine Arts, Boston, in 2016, and the National Gallery of Art, Washington, D.C., in 2017. Before returning for this installation, the Resurrection was also the focus of a special exhibition in 2017–18 in Florence at the Museo Nazionale del Bargello.